Join us on a tour behind the scenes of our TV and radio studios, including Midlands Today, BBC WM and if you're lucky, the studio which is home to the longest running soap opera in the world, The Archers (production schedules permitting). 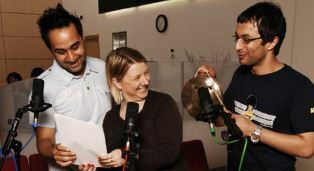 Learn about the groundbreaking and award-winning BBC Three, and discover what it takes to put together high quality news bulletins every day and how BBC radio drama is made. You can even have a go at making your very own radio play which we send you as a memento following your visit! A tour at BBC Birmingham offers visitors young and old the exclusive chance to gain access to the rarely seen world behind the scenes of some of your favourite shows - so book your ticket now. Tours run on Tuesdays, Wednesdays and Saturdays at 10.30am and 1.00pm and last approximately 1 hour 30 minutes. Our maximum capacity is 20 per tour. The building is fully accessible, but please let us know about any access requirements in advance. We want you to get the most from your visit so if you have any special requests please let us know and we will do our very best, where possible, to accommodate you. To book a tour and for more information please contact our booking line on 0370 901 1227 option 2. You will need a minimum of 15 in your party to secure a booking. We’ve also got plenty to see for free in our Public Space which is open seven days a week and there’s no need to book. Fancy being a TV presenter? You can have a go in our special green-screen experience. Read the auto-cue, speak to the camera, and see what you look like on the telly! There’s the chance to get up close and personal with original costumes from Strictly Come Dancing, and Doctor Who fans can get a selfie with the tardis and several of the Doctor’s adversaries, including Derek the dalek. Archers fans won’t want to miss our impressive exhibition which showcases the history, milestone moments and celebrity fans of this radio institution which has been made in Birmingham since it began in 1950. Exhibits include the Archers script for the pilot episode, Archers jigsaws and games from the 1960s, and some of the real-life objects used to create the drama’s special soundscape, known as spot effects. You can even join Ruth and David Archer at our selfie station in Ambridge! Within the Public Space you’ll also find the BBC Blue Room where you can see tomorrow’s BBC... today. This is a free interactive exhibition showcasing the very best in content and services from the BBC, as well as innovative technology we are still developing. Digital experts will be on hand to guide you through and answer any questions you have. Ever tried virtual reality? See for yourself how the BBC is using VR and storytelling to create truly immersive and memorable experiences. Have fun discovering historical artefacts using the very latest in augmented reality from the BBC with the incredible Civilizations app. Our youngest visitors can learn and play with the latest games and services from the award winning BBC Children’s, and all ages will be amazed with the latest developments in UHD television. See programs such as Planet Earth 2 in stunning clarity and colour like you’ve never seen them before. It’s a wonderful opportunity to get hands on and learn more about your BBC so drop by and say hello to the Blue Room team! The Public Space is open seven days a week. Sundays and Bank Holidays 11.00am to 5.00pm. For Public Space enquiries please contact publicspaceteam@bbc.co.uk - please don’t contact this address for any Tour enquiries.